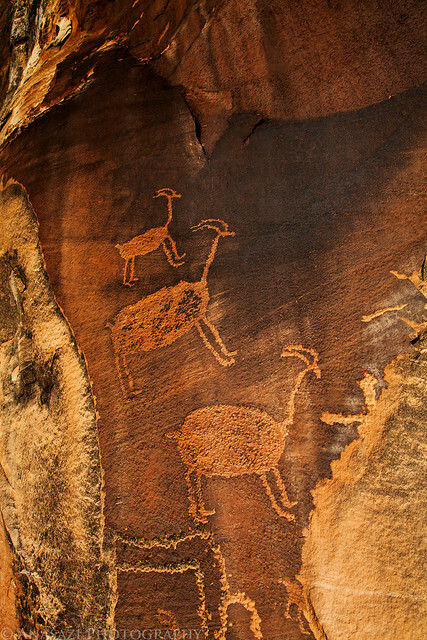 These petroglyphs of bighorn sheep have eluded me for quite some time. I have searched for them before during the many times I have driven through Indian Creek Canyon over the past few years. I knew they were along the road somewhere, but was never able to find them. While driving back from Beef Basin this past weekend, I wasn’t even looking for new rock art when I managed to spot a few new petroglyphs out of the corner of my eye. I almost didn’t stop, but at the last second I decided to pull over and hike back for a few photos. I’m glad I did, because not only did I find the original petroglyphs I spotted, but I finally found this panel nearby. Maybe one day I’ll be able to drive through Indian Creek Canyon without finding any new rock art, but until that point it’s nice to find new things on each visit.